Do you need a fun way for students to practice multiplication facts with minimal prep? 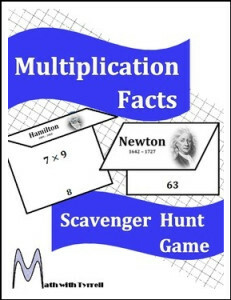 The Multiplication Facts Scavenger Hunt Game gets students up and moving around while practicing math. In this game, students use the answer to one problem to find another problem hanging around the classroom. The student worksheet, scavenger hunt problems, instructions, and teacher’s key are all included. This product is teacher tested and student approved. My students love seeing scavenger hunts on the agenda. The problems in this scavenger hunt require students to know their multiplication facts to 10.